Okay yes that's me on Becker. Yeah i remember ya from becker, i still see ya on there when i catch the occasional rerun. I even remember your lil stint as a cabbie in spin city. It's always funny seeing you pre-hurley. They should take that off and replace it with a picture from that Jack-in-the-Box commercial. With the Jack hat. 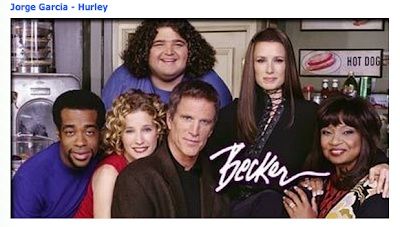 I used to watch Becker! Haha. Now I have to go dig up some old episodes! I think that's supposed to be Henry? Pretty entertaining, although I wish that the article listed where the photos came from. Yours was clear. Ever watch "Tim and Eric" on Adult Swim? Ted Danson made an amusingly strange appearance on that a few weeks ago. What the heck??? That kid doesn't even look like you! That's pretty funny! Oh gosh! That's too funny!! I wonder who that kid is! Wow, yeah, that kid doesn't look like you. The pictures of Jeff Fahey and Alan Dale shocked me. I couldn't recognize them! you know all those jorge garcia's look alike... I saw this a few days ago, and had a great laugh. By the way, has Evi ever had an ugly day ever? Ever?? 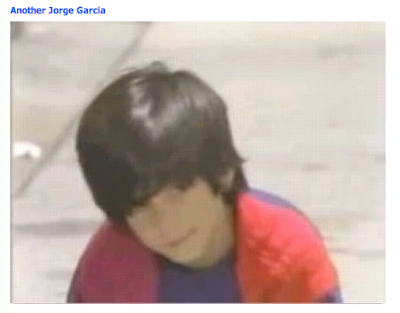 Looks like a kid from Menudo! Awww, Shawnee Smith...she's an amazing actress, isn't she? I always thought she was so underrated. i read on IMDB once that you were in a Mr. T motivational video. I am pretty sure that is from the video "Be Somebody or Be Somebody's Fool"
I was getting a Slurpee last night at 7-11 and they had the cover with Josh Holloway on it. I thought it was strange that he was so prominent, but didn't realize there was more character covers. I just assumed EW had a huge crush on Sawyer. that's the first time I ever saw you was on that tv show..used to watch it all the time cause im a huge ted dansen fan..thought you were soo cute on it..
Nice! Are you going to continue blogging here once the show is over? I hop so! Hey Jorge, did you ever check out Alex's band Hepcat? Great old school reggae ska. Dude! The one with Miles is Rush Hour, I would've never known that was him! Awesome. Yeah, I saw something similar from the dailymail online. Very funny comparing then and now. Hi Jorge, isn't the kid young "Desmond" - Henry Ian Cusick ?! Hopefully Shawnee Smith is as hot in person as she is on screen. Nice. You got to work with Alex Desert, from one of my favorite bands, Hepcat. Haha! Clearly it is "another Jorge Garcia." Not you. Nice to see Mr. Holloway sporting the name of our mutual high school's sports team! BTW the word to type for verification for this comment is "cornhola"
:D Awwwwwwwwwe I loved the "High school" style pictures. I wish they'd list what shows and commercials they were in. Yours is the only one that gives reference to what you were doing in your picture. I couldn't even recognize Terry. And the pics of Dom M. and Alan Dale=LOL! I never realized you were on that show, but I just remember the cool blind guy. Never watched it much. What can I say? It isn't cheers.